Important: Please note that these locks are individually made to order so the usual next day delivery option is not available. Please allow 7-10 days for delivery. After ordering this lock you MUST let us know if the address provided for payment or delivery is different to that of the lock owner. We need this information for security to ensure we keep track of restricted locks within the UK. How is this lock restricted? A restricted padlock is one that uses a key that cannot be copied and is not in common circulation. 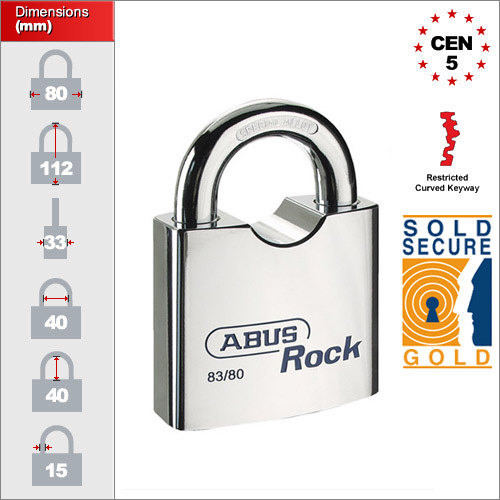 In this specific case the ABUS Rock uses a special Pfaffenhain Y-Cylinder. Pronounced "faffenhine", they are the leading force in restricted lock development and research. 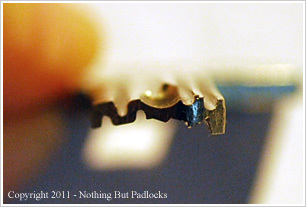 Their unique and patented Y-key is actually curved along its length and has been made using a machine that only ABUS have. There is currently no way that this key can be copied or reproduced. The second protection afforded by the Pfaffenhain Y-Cylinder is the unique way in which each lock produced is recorded and monitored. 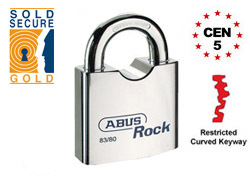 A central record of all the key owners is kept securely by ABUS in their UK headquarters in Bristol. It is important to note that no lock or keyway is 100% protected and in the same way, no padlock is 100% pick proof. Although there is currently no way to copy the Y-Cylinder, criminals and illegal lock-smiths are always developing new ways to overcome security. The only thing that manufacturers can do is to keep on top of research and constantly develop new and unique products. For more information on this type of keyway please see the 'Specification Sheet' above. The ABUS Rock is one of their flagship models made from solid hardened steel with a special "nano protect" coating to help it resist corrosion when used outdoors. All the internal components and springs and fully marine grade / non-corrosive. Since the lock is ultra strong, they designed the body with a small section removed from beneath the shackle allowing even more vertical clearance for use with chains. It is fully rated to BS EN 12320 and CEN grade 5. You can find out more about this in our dedicated insurance grade advice section. If required this lock is available with a plastic key guard like some of the plastic weatherproof models. Each padlock is delivered with 2 keys each and can be made to be keyed alike, keyed different or master keyed. Additional keys need to be ordered directly with us for security purposes. Please note that these locks are "key retaining". This means you need to lock the padlock before being able to remove the key. This prevents you from accidently leaving it open and enabling someone to access the restricted cylinder.